If you have a problem with your order, give us the opportunity to make it right. TomTom GO 600 Trucker Unit. Get in your truck and you're ready to go. Customized Truck Routing. You will receive the following (if it's not listed below, it's not included) They work very hard to get quality products to you quickly. The casing and display screen are lightly scratched and the edges have minor scuff marks from normal use and handling. What is included?. In most cases what you see is what you get. I am located in Denver Colorado so I am centrally located for most of the US. VIA 1625TM. TomTom VIA 1625TM. Your TomTom device receives free traffic information. as they Best Describe the Item. PICTURE OF THE ACTUAL ITEM! No other accessories or parts included. Garmin Real Directions feature guides like a friend, using recognizable landmarks, buildings and traffic lights. This is an incomplete product that has been inspected to be fully functional and may show signs of use. Garmin Real Directions guide like a friend using landmarks and traffic lights. Spoken turn by turn directions. 1x Garmin Windshield/Dash Mounting Bracket. Condition: New (Other). 1x USB Cable. Garmin Drive 6 USA LM EX 6" GPS Navigator w/ Lifetime Maps - NEW!!! Garmin Drive 6 USA LM EX 6" GPS Navigator w/ Lifetime Maps - NEW!!!. Condition is New. Shipped with USPS Priority Mail. This Garmin Drive 6 LM is USED - IN GREAT WORKING CONDITION. See photos for complete details, this will be the actual ITEM that you will receive. Find the perfect spot in your car by adjusting the mount for either windscreen or dashboard use. Wi-Fi® connectivity lets you update without a computer. TomTom GO 620. No computer needed. TomTom part number:1PN6.106.00 backed byTomTom 1 Year Warranty. Drive with worldclass traffic information for the life of your device via your smartphone . Find nearby parking with the aid of your TomTom device. See buildings and landmarks in stunning 3D. Always drive with the latest map. Product Model #: 1AA6.019.01. TOMTOM VIA 1625TM. Product Model # 1AA6.019.01. Product Model: 1625TM. Manufacturer Part Number: 1AA6.019.01. Manufacturer: TomTom International BV. Product Line: VIA. Limited Warranty: 1 Year ". VIA 1605TM. Item is an original TomTom product ready to install. 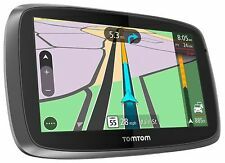 Compatible with the following TomTom models 6" screen size. (Does not work with any other VIA or 6" models). They work very hard to get quality products to you quickly. Fatigue Warning Suggests Potential Rest Areas After Several Hours Of Driving. Bluetooth(R) Hands-Free Calling With Compatible, Paired Smartphone. The SC33 employs a dual GNSS antenna system that calculates a single vector while a 3-axis rate gyro and acceleration sensors add the 2nd vector. Employing a two-antenna system with a 3-axis gyro and acceleration sensors, the SC33 enables high-speed response capability. The magnetic mount lets you easily secure or remove dēzlCam from your truck. dēzlCam LMTHD. HD Digital Traffic is our best traffic solution available. It's fast and free² — no distracting advertising and no subscription fees, ever, for the useful life of your device. TomTom GO 600 Unit. Parking Assist : Find nearby parking with the aid of your TomTom device. Model # 4FA6.001.05. Advanced Lane Guidance : Clearly shows which lane to take at junctions so you don't miss your turn. 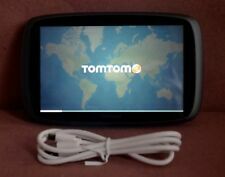 6" TOMTOM VIA 620. DO NOT send without communication. Garmin traffic can give details about the situation, such as how many minutes of delay to expect and if there are any possible detours. Our POI database also includes accurate, relevant information sourced from Foursquare. Item is in Like New condition. Compatible:6" Tomtom Via 62. Used to repair faulty LCD display and touch screen digitizer both at once. We'll promptly reply you.